Your wait for Sprint's next 4G smartphone is almost over. Sprint announced August 31st will be the launch date for Samsung's Epic 4G. The phone will retail for $349.99 but a $100 mail-in rebate will bring the price down to a quarter kilobuck. Yes, that's with a two-year contract. Sprint stores, as well as RadioShack, Best Buy, and Wal-Mart (the ones that weren't open all night), will be opening at 8 a.m on Epic Launch Day. But Sprint is going to make it easy for you to be sure there's an Epic waiting for you. Starting Friday, August 13th, you can reserve (better than pre-order!) an Epic on their website right here and pick it up at a Sprint store anytime on the 31st or the following day, September 1st. If you don't pick it up by 6 pm, your Epic is fair game to the next customer who forgot to reserve one. 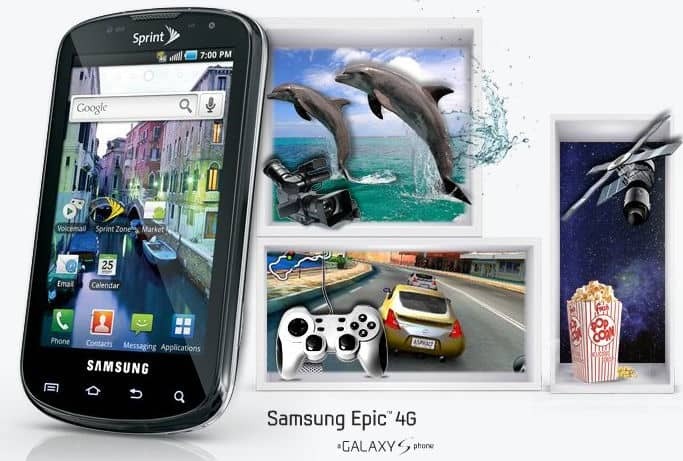 The Epic 4G is Sprint's version of the Samsung Galaxy S. Samsung is releasing versions of the Galaxy S for all four major US wireless carriers. Here's a quick reminder of the Epic 4G's specs for you to enjoy while deciding whether to reserve one. Per ZDNet, this Galaxy S does not have an integrated flash drive. The other models have 16GB of memory while the Epic 4G only has 1GB. Sprint will be charging an additional $10 a month for its Premium Data add-on. If you want your Epic 4G to serve as a mobile hot-spot, that will cost an additional $29.99 a month.